Well you get thoughtful, illuminating and frank discussions, a wonderful sense of connection and belonging, assisted by some tasty breakfast patisseries, coffee and plenty of laughter! The two hours flew by as our speakers shared key challenges and insights from their careers and answered questions from the floor. Splitting up into ‘sub tribes’ to allow those in similar situations to group together to discuss the issues presented, we dived as deep as we could in the time available. This is definitely a theme we shall revisit as it opened up a rich seam of ideas, as well as exposing a real need for this community to get together to talk honestly and openly. The following summary of key points from each of our speakers does not do full justice to the morning’s conversation. I hope however, you can still pick out a few gems of inspiration to help you to ‘grow your green career’. 1. Be prepared to rise to the challenge, the tough situations and do your utmost to deliver your best. Proving your value, especially when starting out, is so important. It brings you to the attention of senior people who can become your main advocates and allies as a result. Results talk. 2. Recognise when you’ve reached the ‘end point’ in your current role, when you cannot progress there anymore. Then rise to the challenge and be prepared to take, possibly, a sideways move in order to build your skills. Progression isn’t always linear or about increasing your remuneration or job title – it’s about growing ‘you’ and enjoying your job too! 3. Get out of your comfort zone to go for those roles or projects you feel you can do but don’t necessarily have all the background/ experience behind you. You might not fit the stated requirements, but if you know you have the transferable skills and the passion to make it work – go for it. Be courageous and show you can – we all can, and need, to ‘learn on the job’. 4. Follow your passion but be flexible. Sometimes we need to close a door on something if it really isn’t working out. So often however, another door will open which takes you somewhere far better that you couldn’t have known about before. 3. Look at what type of professional memberships and accreditations will best serve you and work towards getting those. This could be IEMA or others such as Institute of Corporate Responsibility & Sustainability (ICRS). We can all lose confidence if we take career breaks, for whatever reason. Keep up with your CPD, do courses that build up your ‘value’ and use any KIT (keeping in touch days when on maternity leave) to plug into what is changing at work whilst you are away. 4. Be honest and open with your employer about your ambitions. Explore all opportunities or options first before you decide to move on. 5. But do recognise when it is time for you to go. Don’t allow yourself to stagnant and remain in your ‘comfort zone’. Our salary, as well as our skills, can both suffer. Recognise the value in shifting ‘sideways’. 6. Do the graft – we do need to prove ourselves, especially at the start of our careers. 7. Raise your profile, work on your thought leadership. Whether it is through cultivating those opportunities (e.g. speaking at events such as Women in Sustainability and sector conferences) or developing a twitter following or publishing on LinkedIn – do it! 8. Ensure your CV is fit for purpose. Keep a record of your achievements. Work with a recruiter to help you find the next right position for you. 9. Don’t forget you have a plan! Review it – things do change so keep flexible. 1. Seek out and spot opportunities. You need to believe in yourself enough to create opportunities that suit you. Internal promotion often comes from when you see issues or needs that are beyond your current job description, but you do the work and make things happen anyway! 2. Trust your intuition. Understand when you need to say no. Commit fully when it truly feels right. 3. We’re often dropped into challenging and tricky situations where we don’t know whether the outcome will be positive. Rise to the challenges, do whatever it takes to make it work. 4. Always leave an open door when moving on from a role or organisation. You never know, you might want to come back! 5. Find internal advocates who can support you and put you forward. 6. Pay attention to the details and think things through from all different perspectives. 7. Appreciate your team, name check and promote internally. Support fellow women. Let’s all help each other up the ladder not push it away after us. 1. Get clarity on what is really important to you and what you want from your career. Get to know your values and how you want to experience or live them. Really know your strengths and how you want to use them. Create that guiding star to navigate your path. If this is not clear, work with a coach, a mentor, a buddy to help you. 2. Do the inner work – we all need to do this! Become aware of any negative or limiting beliefs we have about ourselves that eat away at our self-belief and confidence. 3. If we want to have an impact we need to have a voice. Often our ‘inner work’ needs to address barriers to fully expressing our voice, our ideas etc. We need to understand any issues we have with visibility and create opportunities to understand where and how we feel vulnerable, and what to do about it. 4. Flourishing in our green careers requires the 3 ‘C’s. a. Competence – get good, real good, at what you do. b. Confidence – seek to nurture this. We can all lose our confidence at times – it is never a ‘given’. c. Courage – creating or seizing opportunities needs us to get confortable taking risks. Practice being courageous in the small, often un-work related things, can give us the energy, insight and learning, to then bring that courage into our work. 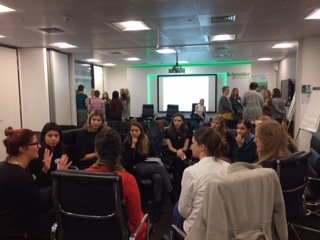 Thanks to Schneider Electric for hosting the Women in Sustainability London Hub and to all our speakers.